ACL season is here! The ten items below are things I found particularly helpful or wish I had brought for my first ACL experience. Smudgy eye makeup and sweaty faces are inevitable when spending an early fall day outside in Austin. Having a handheld mirror on me was helpful between watching sets so I could fix myself before taking photos with friends. For those that have been to ACL, you know the phone service is spotty and finding signal drains your battery quickly. After taking lots of pictures and videos, trying to call/text friends, and looking up the artist schedule on the ACL app, it's important to have a charger to make sure you can get home safely and find your friends with your phone by the end of the day. By the middle of the afternoon on the rainy day I went last year, I wanted a place to sit and lie down without having stains all over me because the ground was very muddy. A portable and packable lawn blanket is perfect for a rest from standing or sitting and listening behind the standing people. It's important to stay hydrated in the hot Austin weather. Many like to carry a water backpack which is very convenient, but I find a water bottle does the trick for me because I don't want to carry two backpacks. Though I used to carry a CamelBak bottle, I just recently made the switch to a Hydro Flask because I didn't enjoy cleaning the CamelBak straw. (Yucky mold!) I'm now partial to the Hydro Flask because it keeps my water cold all day. Recently there have been no clouds in the sky so we need to protect our eyes! I like having my hair down, but after a long and hot day, it's nice to have a few extra hair ties to get my hair off my neck. Many like to carry a cross body bag or money pack, but I find a sturdy backpack is the most practical to store my things. One with lots of exterior pockets gives me easy access to things like my sunnies and my camera. Pickpockets shouldn't be an issue but it is still smart to be careful where you place your valuables! If you're anything like me, you get hungry every two hours. Having hand sanitizer is perfect so you don't need to worry about finding a place to wash your hands before getting something yummy to eat. Speaking of yummy food, here is a list of the food vendors coming to ACL this year. In case the port-a-potties run out of toilet paper, a pack of tissues will come in handy. It is also useful for blotting, wiping off smudging eye makeup, and wiping your hands after eating if there are no napkins around. I almost never leave the house without sunscreen on at least my face. I found that many of my friends that went to ACL last year came back burned because they didn't have on any sun protection. This Supergoop! Sunscreen is perfect for easy re-application. 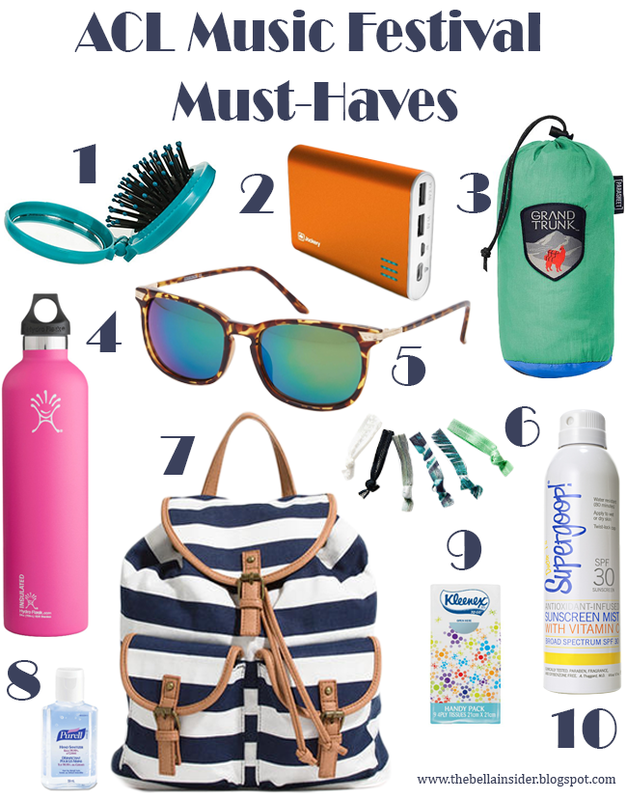 For all you seasoned music festival goers, what are things that you're planning to bring with you? I hope all of you that plan on going have a great time these next two weekends. I can't wait to show you pictures of my time there in two weeks. Have fun and stay safe!